Hull and deck projects include both cosmetic and functional items. Some items fall into both categories such as the most ambitious two foot extension of the hull. 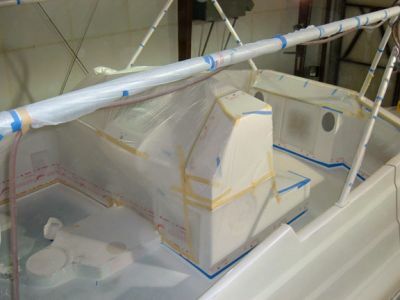 Adding two feet will give the boat a more graceful and sleek look but more than that, it will provide needed additional lift, more wetted surface and a larger cockpit. While each of these items listed has a distinct purpose and will make EZ2CY AQUA EPICUREAN a better vessel, the final touch will be given by the team at Anchor Bay East led by Art Cox with Awlcraft paint. Many things can restore a boat but a paint job done by Artís crew will make her better than new! Click here to visit our sponsors page.